Let's start with the DISCLAIMER: I am no doctor, what I did was not recommended by my doctor (he told me to cut back SOME, but I cut back A LOT), and I make no claims as to the safety of what I did. All I know is that so far, it has done wonders for my weight. If you try it and your arms fall off, don't blame me because I am saying right up front you are completely on your own here. See your doctor first!! Thanks to my wife's urgings, I went on a self-modified version of the Atkins diet. Results: in three months, with little effort, I went from 185 to 149 pounds. That's about 12 pounds per month. And I wasn't hungry. No sugar, no potatoes, no pasta, no bread, no rice, no milk (I've never used alcohol, but that is on the forbidden list too). That's it! That is absolutely all there is to it. To replace those things, I ate a lot of meat (steak, cold cuts, hot dogs, fish, chicken, turkey, bacon, you name it--lots of meat).. Strawberries (or any other berries) and sugar-free jello took care of my sweet tooth. My pounds just disappeared on this diet! And I'm not hungry, and whenever I want something I'm not allowed I just remind myself that my health is of tantamount importance. We go to buffets (Golden Corral, Ryan’s, Hometown Buffet) once in a while, and I eat steak, some salmon, some chicken, a salad, green beans, and dessert from their sugar-free table (pudding, jello, they even have sugar-free whipped cream). For breakfast I usually have a ham and cheese or turkey and cheese rollup "sandwich" without the bread (I roll a couple of slices of meat up with a couple of slices of cheese, like a jellyroll), or a low-carb tortilla (see photo below) with peanut butter and low-sugar jelly, and half a glass of milk with a teaspoon of Carnation No-Sugar-Added Instant Breakfast.. If I'm still thirsty, a glass or two of ice water. For lunch I usually make a lettuce salad with diced tomatoes and chopped-up ham or turkey. I eat Breyer's Carb Smart ice cream for dessert. For supper, some fish sticks, or a couple of meat sandwiches (ham, turkey, hot dogs, bologna) made with low-carb tortilla shells from Sam's Club (see below). You can go to McDonalds or Burger King, and order hamburgers or dollar-menu chicken sandwiches with no buns. They put them in those little plastic containers they use for breakfast sandwiches. At first this was confusing to them, but it seems to be universally accepted now. We used to eat at Ci-Ci's Pizza (they’ve left town now – ARG! ), and they made us special pizzas without crust--they just put the sauce, cheese, and toppings in one of the aluminum pans they used for deep-dish pizzas and ran it through the oven for us. Ask for an Atkins or low-carb pizza. We loved going there because it was all you could eat for under six bucks. If you are embarrassed to ask for food without bread or crust, just tell them you are allergic to flour. Works for me! My wife makes her own pizza, using scrambled eggs for the crust instead of dough. She loves this concoction. If you want the documentation, read one of the books by Dr. Atkins. I see them at yard sales a lot, or your library will have them if you don't want to spend the money. By the way, my wife knows much more about the theory behind this than I do, and she tells me it takes longer for women to lose weight than men. So ladies, give it some time to kick in. I love Breyer's Low-Carb ice cream (see photo below), which is about $4.00 a carton at Wal-Mart (and frequently 2 for $5 at Meijer's). I have been able to stay on this diet with no problems at all, and I don't see me ever falling off the wagon. By the way, I recently saw a diet book that said "no white food after 6:00 pm." I looked at my list above, and everything on it except alcohol is indeed white. Weird. The other component (here it comes) is exercise. Do some! Best is to join a gym with an elliptical machine. Use it 20 minutes every other day. Pedal fast for 8 seconds, then slow for 12 seconds. It should have a timer on it, and you just start pedaling fast at :00, :20, and :40. Go slow at :08, :28, and :48. Studies have shown that 20 minutes of fast-slow does more for you than 30 minutes of steady speed. If you don't want a gym, just walk! Get a pedometer (just a buck at Dollar Tree) and walk 10,000 steps a day. Explore your neighborhood! Walk to the store, the post office, the grocery, wherever. Just walk. Get a radio with earphones or an MP3 player. I listen to a lot of old-time radio shows while I walk - Jack Benny, the Shadow - and the time flies by for me. Finally--Let me know if you try this, and how it works for you. Email me at danhughesmail@gmail.com. P.S. My wife is a member of a low-carb bulletin board. Other people on this type of diet post their diaries and notes to each other. Lots of friendly people helping each other, and it's all free. If you have trouble staying on a diet, the low-carb board will be a great help to you. Highly recommended! Check it out at http://forum.lowcarber.org/. 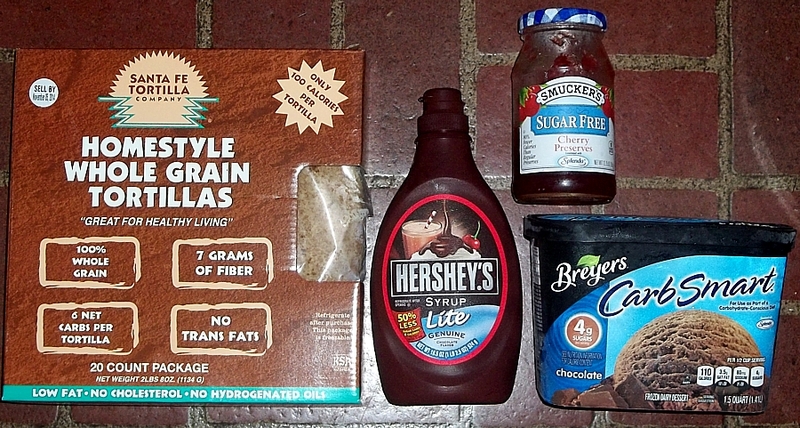 Sante Fe Tortillas (They now come in plastic rather than cardboard, and they have dropped from 6 to 5 carbs), Hersey's Lite (50% less sugar), Smucker's Sugar-Free Cherry Preserves, and Breyer's Carb Smart Ice Cream.